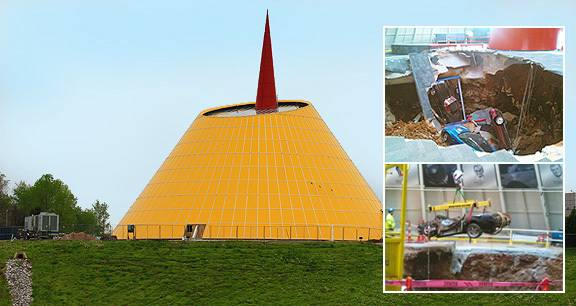 Project obstacles and solutions: On February 12, 2014 at 5:44 a.m., a sinkhole underneath the Skydome at the National Corvette Museum collapsed its floor and swallowed eight cars that were on display. The hole measured 40 feet across and dropped 28 feet down. After the event, a structural engineer determined that the building’s foundation was in jeopardy of also falling into the cave below. Hayward Baker was called in to secure the rest of the structure and Scott and Murphy Construction was hired to rebuild the floor. The cavern under the museum is filled with underground rivers. Some had thought the simple solution to the sinkhole was to fill in the cave with stone and build the floor on top of it. However, in rainy weather, the water would be forced to find another outlet and could do even more damage. It was determined that to stabilize the foundation and the floor, a series of micro-piles would be built into the bedrock of the cave floor. These micro-piles would tie the footing and floor to the bedrock. This would stabilize the structure and keep it from being impacted by shifts in the cavern roof. Hayward Baker built 46 micro-piles under the footing of the round structure and over one hundred micro-piles for the slab floor. IMI supplied 500 yards of 3,000 psi fine grout for the micro-piles. IMI supplied Scott and Murphy with 400 yards of 4,000 psi concrete for the new floor. Scott and Murphy built a manhole in the floor of the museum that leads to the cave below. This allows for inspection of the cave to prevent any further surprises. IMI’s role went beyond supplying concrete for the new floors. Scott and Murphy also wanted to seal up the cavern walls from water seepage underneath the structure. They filled the sinkhole portion of the cave with 3,800 tons of crushed aggregates. They then applied shotcrete to the gaps and cracks of the cave directly under the Skydome. IMI supplied 100 yards of shotcrete to seal cracks. The Skydome repairs are expected to wrap up in July. Click here to see a video of the sinkhole.